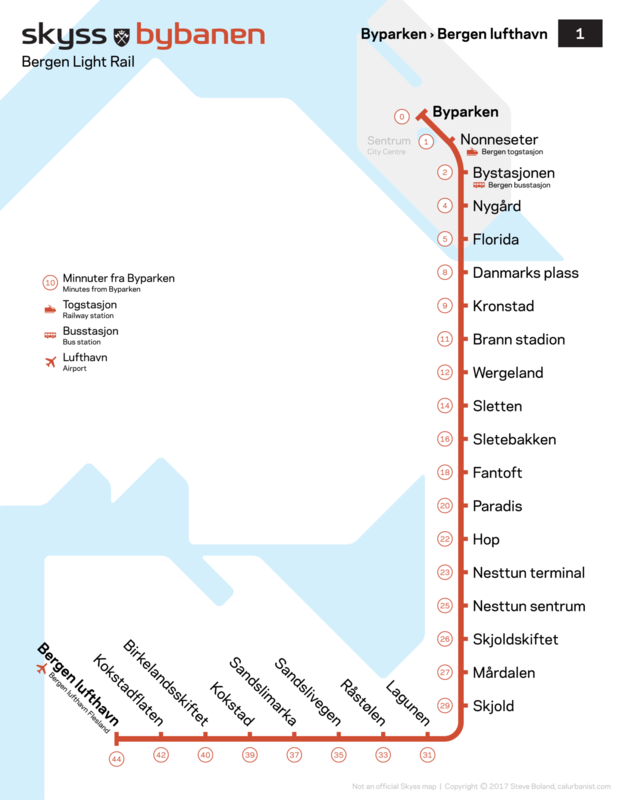 Norway’s second city is quite a bit smaller than Oslo, and so is its local rail system — in fact it’s just a single light rail line (the capital has five metro lines and another six tram routes, in a metro area of 1.6 million people). But that doesn’t mean Bergen can’t have informational materials to match Oslo‘s, or for that matter Stockholm‘s. For some reason, the operator (Skyss) has developed modern and stylish area maps, but its now decade-old light rail system still has to make do with a basic and rather clunky strip map. Fine, it’s a single line — but this is Scandinavia, where design standards are among the highest in the world. Stylistically, this map borrows from Oslo’s. Colors and typeface (Galaxie Polaris) are in the Skyss corporate scheme, and like the current light rail map, it includes travel times.